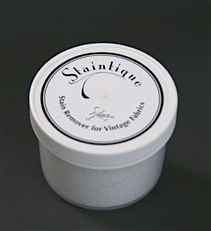 Staintique Whitens, brightens, and removes stains from antique and vintage fabrics. Staintique contains no phosphate or chlorine bleach and most importantly it will NOT weaken textile fibers Great for antique linens. Whitens, brightens, and removes stains from antique and vintage fabrics. Staintique contains no phosphate or chlorine bleach and most importantly it WILL NOT weaken textile fibers! Great for antique linens. This is also another customer requested product. Please don't stop asking for what you want. It just might be the next thing we create.